Humphrey Paget had the unique distinction of being the only artist in the 20th century to design the obverse (heads) side of UK coins for two different monarchs – initially for Edward VIII and subsequently for George VI. This is explained by the extremely short reign of Edward VIII, which lasted only 326 days. Succeeding to the throne on 20 January 1936 following the death of his father George V, he abdicated on 11th December in order to marry the American divorcee Wallis Simpson. His coronation never took place. Humphrey Paget had previously designed a medal for the Honourable Company of Master Mariners, featuring Edward when he was still Prince of Wales. This was liked by both Edward and the Deputy Master of the Mint, so when Edward became King, Paget was the obvious choice to design the new coins. There was a problem immediately. Since King Charles II replaced Oliver Cromwell, there had been a tradition in UK coin design that the head of the succeeding monarch should face in the opposite direction to that of the previous ruler. George V’s head had faced to the left, so Edward’s should have faced right. Edward, however, felt that wasn’t his best side, and insisted his head should face left to show the parting in his hair. Paget’s design was forced to break with tradition. The abdication meant that only a few Edward VII coins reached the trial minting stage, and none were ever officially struck as common UK currency. Their rarity makes even the trial strikings especially sought after by collectors, and consequently very valuable. The 1937 Edward VIII Proof Sovereign sold at auction for £516,000, and the holy grail of numismatists, the Edward VIII 1937 Proof Set, was sold in 2010 for $2.1 million. With Edward VIII’s abdication, Humphrey Paget was now tasked with designing the new obverse for the George VI coins, and time was tight. Despite completing it in less than a month, any concerns that he may have rushed the design were totally dispelled when the coins were struck. Paget’s George VI design has been described by experts as ‘the classic coinage head of the 20th century’. A handsome, unadorned and appealing portrait, it was also technically near perfect, a quality for which the Royal Mint must have been grateful, given the urgency involved in striking the new coins. Incidentally, George VI’s head also faced left, the reasoning being that Edward VIII’s should have faced right! Only one Sovereign was issued during George VI’s 16 year reign, for his coronation in 1937. Of course it featured Paget’s magnificent portrait, with the Pistrucci St George and the Dragon on the reverse. It was never circulated, and only issued as part of a four coin proof set, so it too is very valuable. Paget was a highly prolific designer of coins and medals, at his most productive post-World War II. He created seals and medals for many institutions, and coins for numerous countries, from Bolivia to New Zealand. One of his best-loved UK coin designs was, perhaps ironically, for a coin of low value – the image based on the Golden Hind sailing ship, which was used on the halfpenny coin from 1937 until decimalisation in 1971. His last major commission was a medallic portrait of the Duke of Edinburgh in 1970. Humphrey Paget was also a well-regarded sculptor, perhaps not surprising for someone who had come from such an artistic family. His father had illustrated the original editions of Robinson Crusoe and Treasure Island, and his uncle had illustrated the Sherlock Holmes stories first printed in the Strand magazine. Paget married in 1942, was awarded the OBE in 1948 and died in Sussex in 1974. Born in Melbourne, Australia in 1863, Edgar Bertram Mackennal never really liked his first name and preferred to be known as Bertram (although there’s no record his wife Agnes ever called him Bert). 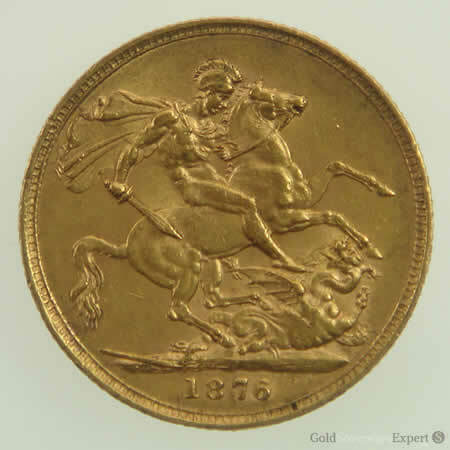 Mackennal’s relevance to Gold Sovereigns is his design of the head of King George V, used on all UK coins from 1911. Although George V acceded to the throne in 1910, the sovereigns produced that year still featured the head of his father Edward VII, making 1911 the first year of the King George V sovereign, which was minted in London, Mackennal’s home city of Melbourne, and in Perth, Sydney and Canada. The route to Edgar Bertram Mackennal being chosen to design the King George V coins is an interesting one. Mackennal was a well-travelled man, in an age where the voyage from Australia to Europe required a commitment of several weeks. He first left Australia for England at the age of 19, having studied at the Melbourne School of Design and wanting to broaden his knowledge and experience, at London’s National Gallery and Royal Academy of Arts schools. Finding his worthy studies rather dull, Mackennal then enjoyed a sojourn in the lively, cosmopolitan atmosphere of Paris. A commission to sculpt the likeness of a British Army officer saw him return to England, where he married Agnes. An extended honeymoon took them to Italy and Paris; it also exhausted their savings and urgently needing some income, Mackennal was forced to exchange the exhilarating continent for the rather contrasting environment of the Coalport Potteries in Shropshire, where he was Head of Modelling and Design. Whilst there, Mackennal entered and won a competition to design the sculpted reliefs on the façade of the Australian Parliament building in Melbourne. This necessitated a voyage back to Australia to produce them and was followed by further commissions. So it was another four years before he could return to Europe; the actress Sarah Bernhardt urged him to go back to Paris, then regarded as the crucible for all the most exciting and original artistic inspiration. It certainly seemed to work for Mackennal. He created his figure of Circe, which was exhibited first in Paris and then at the Royal Academy in London. Here it attracted even more attention, the result of Victorian prudery. It was not so much the shapely, naked figure of Circe herself, but the rather more explicit depictions around the pedestal that apparently required being concealed by blankets. This extra publicity did Mackennal no harm at all, leading to several more commissions and yet another voyage back to Australia, in 1901, to execute them. By the time Mackennal was once again in London, Queen Victoria had died and the Edwardian age had begun, with the brief reign of Edward VII. Mackennal was awarded several significant commissions, including the medals for the 1908 London Olympics. Still in his forties, he became an associate of the Royal Academy, and later a fellow. On the death of Edward VII, Mackennal designed the tomb of the late King for St. George’s Chapel in Windsor, and subsequently the obverse of the King George V coins, including the Gold Sovereign. Edgar Bertram Mackennal was made a Knight Commander of the Victorian Order in 1921, becoming Sir Bertram Mackennal and securing his place in history as the first Australian artist to be knighted. He continued sculpting throughout the 1920s, although by this stage some of his work was considered rather conservative. But by then surely Bertram had earned the right to settle down a little, after years of heady bohemianism in Paris, and thousands of miles travelled between Europe and the land of his birth. He died, suddenly, at his home in Devon in 1931. 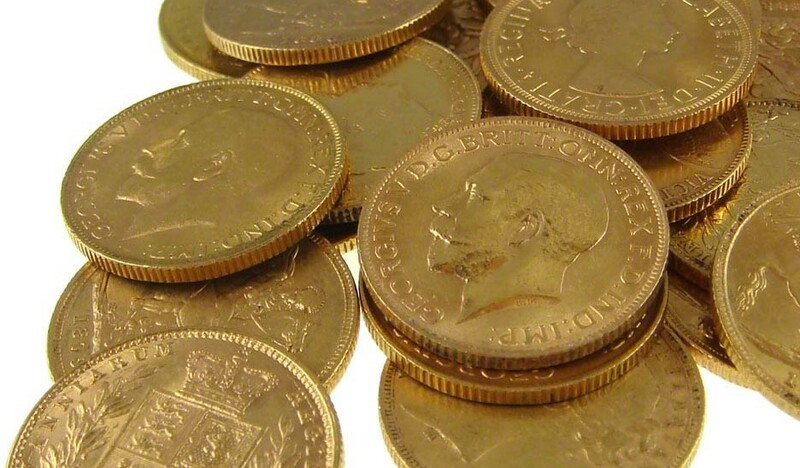 When purchasing gold sovereigns, the rule ‘buyer beware’ should always be in the forefront of ones mind. 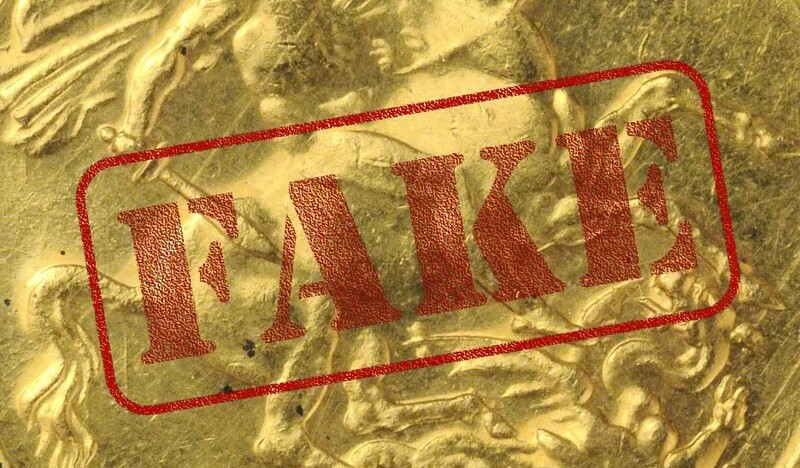 This article takes a look at some examples of fake gold sovereigns. Due to the nature of gold, sovereigns are very difficult, though not impossible to counterfeit convincingly. At 19.3g / cm3, gold has one of the highest densities of all metals, beaten only by the likes of tungsten, platinum and plutonium. So creating convincing fake gold sovereigns using a cheaper metal is pretty darn difficult, they’re either going to have to be under weight, or too big. If the dimensions of the fake are accurate (diameter and thickness), it will be too light and if the weight of the fake matches a genuine coin, it would either have to be thicker and / or wider to accommodate the additional material. In most cases, nothing more than a keen eye is needed to spot a fake sovereign. However, there have always been additional aids to help prevent the inadvertent mistake. Walk-in to any shop in the 18th or 19th century and you would have most likely seen a sovereign balance sitting on the shop keeper’s counter. A sovereign balance with a fake sovereign that’s too wide to pass through the slot. To weigh and guage sovereigns and half sovereigns, being so exact that no counterfeit can possibly go through the guage, of sufficient weight to turn the balance. Its thickness must be no greater than 1.6mm. The balance has two platters, one for full and one for half sovereigns. The slot in the centre of each platter is to check the thickness of a coin. If the coin didn’t pass through the slot, it was too thick and therefore not genuine. Placing the coin onto the balance would verify the diameter of the coin. Too wide & it wouldn’t sit inside the platter. Finally, if the balance failed to settle horizontal, the weight of the coin was incorrect and therefore rejected. Today, we have the benefit on hand-held and desktop XRF scanners. XRF stands for X-Ray Fluorescence and the devices operate by firing a beam of x-ray radiation at the item to be analysed. The x-rays are energetic enough to cause the item to throw off electrons which the scanner is able to analyse and thus determine its composition. XRF scanners are however not cheap. With a price tag of 5-figures, a small dealer is unlikely to have such a device and must therefore rely on his or her skill and experience in spotting a dud. We often see fake sovereigns and when able, we’ll acquire them for our own reference. Here are some examples of good and not so good counterfeits. Whilst most fakes are made of lower grade gold, counterfeits in 22ct gold do exist. Being the same size & same weight as a genuine sovereign, what’s the point in going to the effort of creating a fake? Of course, it’s all down to their rarity & their numismatic value, rather than the bullion value. Some of the best and most convincing fakes are believed to have originated from Lebanon, sometime in the 1970’s, courtesy of one Said Chaloub. He was either influenced or financed by an American called Harry Stock, another counterfeiter, who was caught by the Swiss in 1977. Lebanese fakes all tend to be of rare years, such as the 1917 example below. Had this been genuine, it would have been worth in-excess of £14,000! A Lebanese fake 1917 gold sovereign. The detail on this coin is excellent. Indeed, many dealers have been caught out in the past because they do look quite convincing. However, look a little more carefully and the alarm bells should start ringing… Below is a close-up image of the fake vs a genuine sovereign. You’ll see that apart from the usual knocks & scuffs, the counterfeit has an uneven ‘pimply’ surface. Edges are not as defined as they should be and there’s a significant amount of detail missing, particularly on the horse’s tail. Comparing the detail on a fake sovereign with a genuine one. Whilst the Lebanese fakes are are of quite good quality, many Italian counterfeits are downright rubbish. Even though it’s fairly easy to spot a fake in the flesh, or from close-up images, it’s another matter when you’re relying on small, poor quality photos. Unfortunately, many unwitting buyers get duped when buying from sites like eBay. A very easy fake to spot. The fist thing you notice is the die axis is off. Holding the coin using thumb and forefinger and rotating it on a vertical axis shows that the obverse and reverse faces are not in-line with each other. When you flip a sovereign over, don’t necessarily be put-off if one side appears upside-down. Sovereigns minted up to 1887 had a reverse die access. The next giveaway is this is supposedly an 1897 London mint sovereign. The problem being, in 1897, sovereigns were only minted in Melbourne & Sydney! Closer inspection reveals incorrect placement of the date and obvious imperfections around the outside edge. Finally, the downright ugly! At first glance, you might think the example below is just a heavily worn coin, hence the lack of detail. 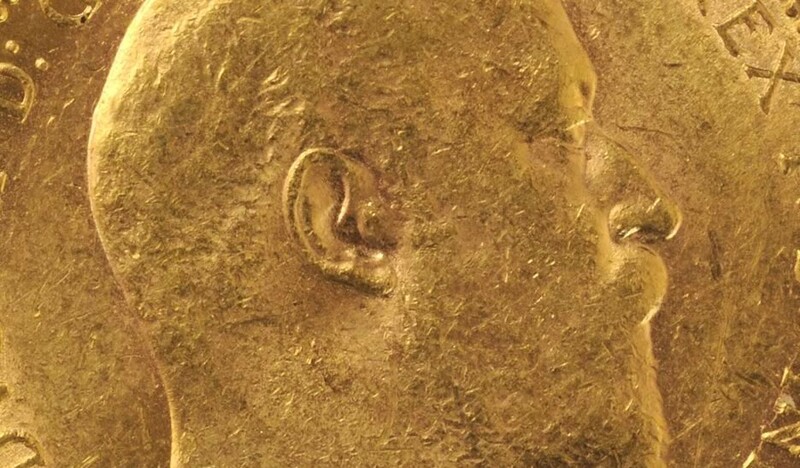 However, a worn coin would typically show signs of wear on the high points on the faces, thus having much flatter surfaces. Genuine sovereigns are created by striking a blank with a die to create the impression of the coin. Many fakes are cast using a mould, which results in a very crude copy. Cast coins often have a slippery or soapy feel when handled. The border is too wide, it lacks detail and is also uneven. At 7.62g, it’s significantly under-weight, it’s way too thick 1.89mm and it’s also too wide at 22.33mm in diameter. As for the gold content, an XRF test reveals a purity of just 59.9%, which means the scrap value of this coin is just £ ($ / €). Compare that to the bullion rate for a sovereign, which is currently £ ($ / €) and you see the potential profits involved. While some of the individuals profiled on Gold Sovereign Expert were concerned solely with designing or engraving, George William de Saulles was a true all-rounder, who designed, modelled and engraved the majority of his coins and medals. He honed these skills during a varied period of training, apprenticeship and early commissions. After studying at the Birmingham School of Art, he apprenticed to a local die sinker who ensured William had a wide range of tasks. While some of the jobs were not particularly satisfying, the experience was to prove valuable in later years. William next worked for a London die engraver, before returning to Birmingham at the age of 26 to work for the medallist Joseph Moore. Four years later he arrived at the Royal Mint, following the death of Leonard Charles Wyon. In 1893 De Saulles was gazetted as Engraver to the Mint, which effectively meant he did not hold a full-time post but was on a retainer. However, he did a considerable amount of work for the Royal Mint until his early death in 1903. For us, George William de Saulles most pertinent achievement was his work on the dies for the 1893 Gold Sovereign and associated coins, designed by Sir Thomas Brock. This was the veiled head image of Victoria. The last Great Seal of Victoria in 1899 was entirely William’s work, and he also designed and engraved the dies for the new King Edward VII coins in 1902. De Saulles was part way through working the Seal of Edward VII when he died the following year, after a short illness. Records don’t show the cause of his illness, but perhaps it was simply the strain of so much work. He was renowned for his prodigious output, producing more than 30 medals and seals – quite remarkable, bearing in mind designing and engraving are both painstaking, time-consuming processes. His work ranges from the commercially inspired to the commemorative, from the British Trade Dollar to the Queen Victoria Diamond Jubilee medal, and for military campaigns such as the highly regarded Ashanti medal of 1900. And of course, he also worked on many coins. De Saulles designed the Britannia seen on the reverse of bronze UK coins from 1895, and many colonial coins for British East Africa, British Honduras and India. He was born George William de Saulles in 1862, in Aston Manor, Birmingham. The foreign sounding surname was the result of Swiss family origins, although two generations had already lived in Britain; his grandfather had been a Page in the Royal households of George IV and William IV, and his father was a glass merchant. Although he married in 1884, he had no children. Within his lifetime, William de Saulles was regarded as one of the greatest medallists and engravers, a reputation that surely would have been further enhanced had his life not ended so early. One of the most searched questions about the gold Sovereign has to be ‘How much is my gold Sovereign worth?‘ Do a search on Google and you’ll find the question asked on dozens of sites. Of course, if you find the question answered and a value given, whilst it was probably correct at the time of writing, it’s unlikely to be still correct weeks, months or years later. A bullion gold Sovereign is currently worth £ 230.54	($ 299.97	/ € 266.45	). The bullion value of a gold Sovereign is calculated at 7.31 x the price per gram of the prevailing gold price. It can also be calculated at 0.235 x the gold price per troy ounce. Our article Gold Sovereign Value by Currency lists the current bullion value of gold Sovereigns in 13 currencies. Answering the question is however not quite so straightforward as it seems. On a simple level, many Sovereigns are worth their bullion value. However, other Sovereigns have a higher, numismatic value. The value of a Sovereign is dependent on a number of factors. The condition of the coin. So, the Melbourne mint, young head shield Sovereign is far more scarce than a Melbourne mint, young head St. George Sovereign. Referring to the 2014 edition of ‘Coins of England’ by Spink, a valuation of £900 is given for the former in ‘fine’ condition (the lowest grade of interest to collectors). Compare this to the latter, being a far more common example, its value is in its gold content (bullion value). Simply looking at the mintage number for a particular Sovereign issue is not necessarily an accurate indication as to its scarcity. Many Sovereigns were shipped overseas to settle government debt. These coins would almost certainly have been melted down on arrival to their destination, thus increasing scarcity. Although over a million 1917 London mint Sovereigns were originally produced, it’s now an exceptionally hard coin to find, so be prepared to pay a four or five-figure sum if you want one! It’s always worth keeping a sharp eye out for Sovereigns that occasionally appear with errors in the strike. 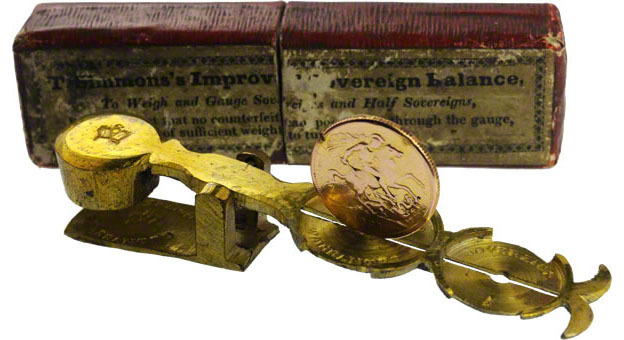 As the demand for Sovereigns increased around 1843, more dies were having to be produced. Quality control was not quite a tight as it could have been and as a result, errors started to appear. So, if you come across an 1844 Sovereign with the first ‘4’ upside-down, it’s worth around double a standard example from the same year! Putting the numismatic value to one side, at very minimum, a gold Sovereign is worth its weight in gold, otherwise referred to as its bullion value. If it’s in relatively unworn condition, it should still weigh 7.98g or thereabouts. 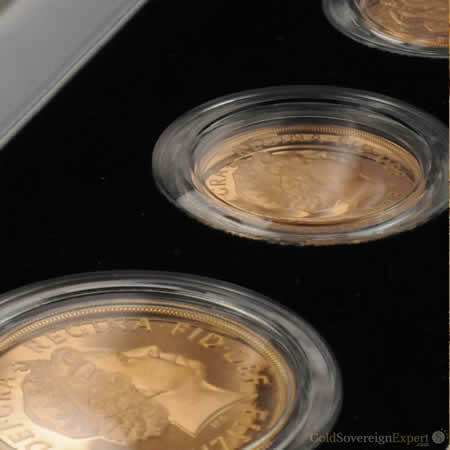 A Sovereign is minted in 22ct gold, which means it contains 91.67% pure gold (7.31g by mass). 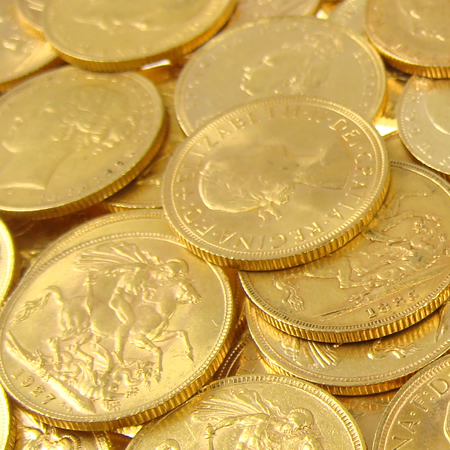 To work out the bullion value of a Sovereign, we need to do some simple calculations. Pure gold is currently trading at around £ 980.07	/ troy ounce ($ 1,275.24	/ € 1,132.79	). There are 31.103 grams in a troy ounce, so to convert troy ounces to grams, we need to divide by 31.103. 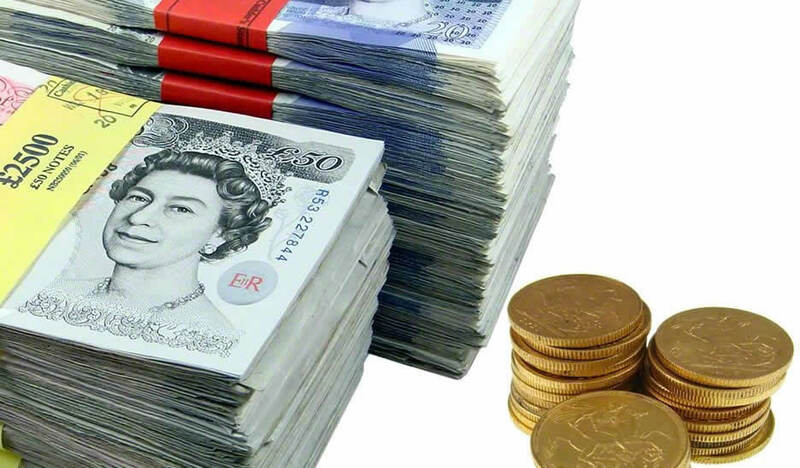 Therefore, the value of 1 gram of pure gold is £ 31.51	/ g ($ 41.00	/ € 36.42	). We already know that a Sovereign contains 7.31g, therefore the bullion value of a gold Sovereign is currently 7.31 x 31.51	= £ 230.54	($ 327.18	/ € 290.63	). For the purposes of this article, we update the the gold price twice a day, around 11.00am and 3.30pm GMT. If you work these figures out manually, it’s likely your answer will differ by a few pence. It’s simply down to rounding and the number of decimal places our system works to. See our article Gold Sovereign Value by Currency for up-to-date bullion valuations in 13 currencies. Millions of people around the world have seen the work of Sir Thomas Brock and probably not been aware of it. He designed the huge Imperial Memorial to Queen Victoria, which has stood in front of Buckingham Palace since 1911, featured in countless tourist photographs, holiday brochures and news clips. This Worcester-born sculptor was responsible for many notable memorials, statues and sculptures, often on an epic scale. Like the Imperial Memorial, his statue of Edward the Black Prince in Leeds, the Titanic Memorial in Belfast and the Queen Victoria statue in Birmingham are all significantly larger than life and redolent of the confidence of the Victorian and early Edwardian age. 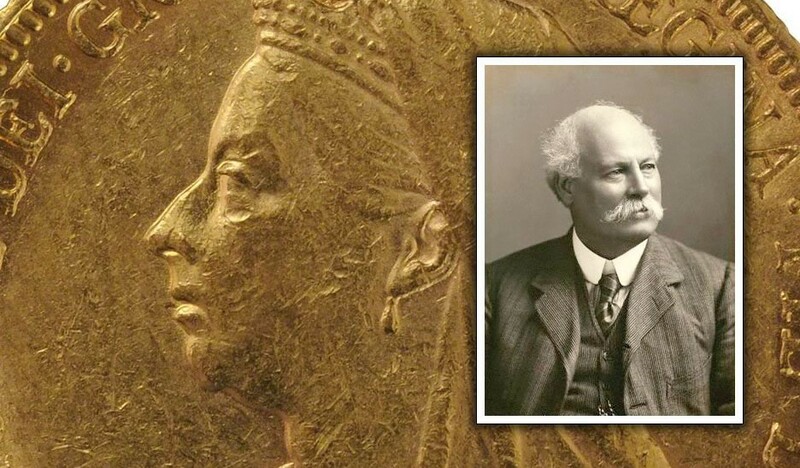 Brock’s importance for numismatists is his ‘veiled head’ of Queen Victoria, introduced in 1893. His design was chosen from a competition organised by the Royal Mint in 1891, for a new image to replace the widely disliked Golden Jubilee image created by Sir Edgar Boehm. Six other artists competed, but it was Brock’s design which most appealed to the judging committee. It may have helped that Brock’s Diploma work at the Royal Academy in 1891 was a bust of his close friend Lord Leighton, who was also a leading member of the Mint’s committee. Nevertheless, Brock’s design almost certainly won on merit. After the faintly comic appearance of Boehm’s Victoria wearing what looked like a tiny hat, Brock’s “dignified and distinctive” design must have come as a huge relief; it was far better suited to a Queen perpetually in mourning for her beloved Prince Albert. Brock’s image shows her wearing her widow’s veil, which partially obscures a modest tiara, and also the Star of the Garter. Close examination of the coins bearing his design shows Thomas Brock’s initials engraved very small at the base of the Queen’s neck. 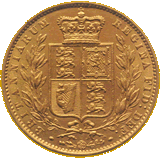 The Gold Sovereign, and the silver coins, were minted from 1893, with the design introduced for lower value coins two years later. Brock’s Victoria also appeared on a number of commemorative medals, including the Royal Victorian Medal of 1896 and the Diamond Jubilee Commemorative Medal released the following year. The image was the last of Victoria to be used on UK coins until her death in 1901. Thomas Brock attended the Worcester School of Design before being apprenticed as a modeller at the famous Worcester Royal Porcelain works. He became a pupil of the sculptor John Foley in 1886; when Foley died in 1874 Brock took over many of his commissions, the best known being the statue of Prince Albert, for the Albert Memorial in Kensington Gardens. By then Brock had entered the Royal Academy School, becoming an Associate of the Royal Academy in 1883 and a Royal Academician in 1891, allowing him to add the letters RA after his name. It was during this period that he became friends with Lord Leighton, who occasionally used Brock’s studio near Regents Park. So it was no great surprise that Brock’s Royal Academy Diploma work was a bust of his friend, or that Brock was chosen to sculpt the monument to Leighton following his death in 1896, finally erected in St Paul’s Cathedral in 1903. The latter part of Brock’s career from 1901 was dominated by his work on the vast, 82 foot high Victoria Memorial, at the head of The Mall in front of Buckingham Palace. Hugely complex and demanding, it apparently so impressed the current monarch King George V at its unveiling, that he knighted Thomas Brock on the spot. Sir Thomas Brock died in London in August 1922. While many of the Royal Mint’s coin designers have been sculptors, Timothy Noad has made his name in another art discipline: calligraphy. Producing heraldic commissions as a Herald Painter at the College of Arms and working in a different medium, he’s brought a fresh approach to the Mint’s coin design. This is reflected in his designs for the Gold Sovereign issued for the Queen’s Silver Jubilee, and for the more recent £1 coins. Timothy Noad studied at the Reigate School of Art and Design, at Birkbeck College (University of London) and the Courtauld Institute of Art. He has worked for the Royal Household and several major London institutions such as the City Livery companies – and, of course, the Royal Mint. His first Gold Sovereign design was for 2002 Queen’s Golden Jubilee year issue, and featured a more modern, slightly ‘cleaner’ interpretation of the shield design last used for Queen Victoria’s Golden Jubilee, showing the Royal Arms surrounded by a wreath of laurel. 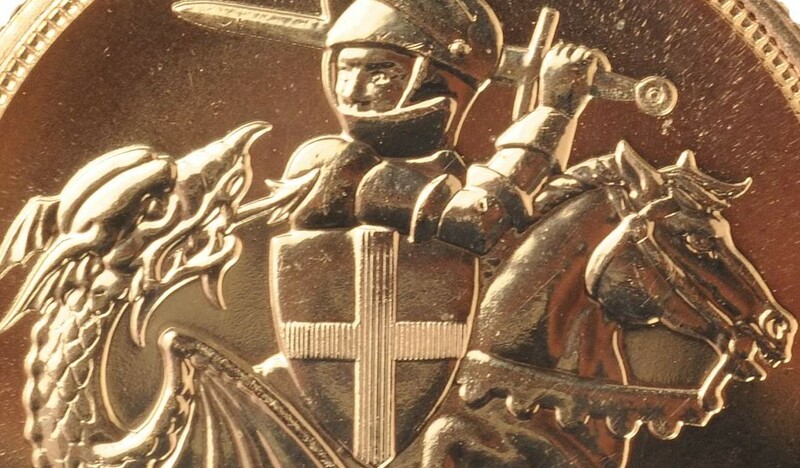 For the 2005 Gold Sovereign, Timothy Noad gave the classic image of St. George and the Dragon a much more contemporary look. Strikingly different from Bernadetto Pistrucci’s well-known and much-used representation, Noad’s St George appears more animated and dynamic, ready to swipe the dragon with a mighty backhanded stroke! These designs also appeared on the Half Sovereign, Double Sovereign and Five Pound coins, which the obverse showing Ian Rank-Broadley’s portrait of the Queen. In 2004 Noad had produced a set of designs for the Royal Mint depicting national symbols: a crowned lion for England, a unicorn for Scotland, a dragon for Wales and a hart (stag) for Northern Ireland. Probably intended for use on the next issue of £1 coins, they were passed over in favour of a series of images of British bridges, designed by Edwin Ellis. Nevertheless, the Mint thought sufficiently well of them to produce them as pattern pieces for sale to collectors. Clearly the concept of using national symbols stayed with Timothy Noad when he was commissioned to mark the 30th anniversary of the introduction of £1 coins in the UK (which replaced the previous £1 note). This time his images were based on the floral emblems of England, Wales, Ireland and Scotland, and were introduced over a period of two years starting in 2013. Among his more recent works, Timothy Noad created an elaborate piece of calligraphy for the Queen’s Consent document, in 2011. This was required to show that the Queen gave consent for the wedding of Prince William and Kate Middleton. Timothy Noad is also a Scribe to the Crown Office at the House of Lords, a Fellow of the Society of Scribes and a Fellow of the Calligraphy and Lettering Arts Society. He’s published a number of books on calligraphy and regularly gives lectures and hosts workshops. External link: Timothy Noad’s web site. Born in 1925, Bernard Sindall designed several coins with many attractive designs, but one in particular was most significant for the Royal Mint. In 1989 the Mint issued a special Gold Sovereign marking the 500th anniversary of the first Gold Sovereign, produced in 1489 for Henry VII. The anniversary designs were only ever used for this particular year, and equally uniquely, they were both created by one person – Bernard Sindall. For his inspiration, Sindall looked to the first sovereign design of 1489, keeping the overall look while adapting it to current demands. So on the obverse, it is Queen Elizabeth II who is seated on the throne, and holding staffs of office – the King’s Sceptre and the Rod of Equity and Mercy. On the reverse, in a departure from the traditional St George and the Dragon design of Bernadetto Pistrucci, Sindall showed the royal crown and shield, set in the centre of a double rose, which reflected the Tudor origins of the original Gold Sovereign. There is one other unique aspect of the 500th Anniversary Gold Sovereign: it’s the first imperial sovereign ever to have the actual denomination stamped on the coin. As well as the Gold Sovereign, the Sindall designs also appeared on the Half Sovereign, Two Pound and Five Pound coins. Although the Royal Mint didn’t quite reach their sales target for the 500th Anniversary Gold Sovereign during its year of issue, the coin is now highly sought after. It was issued in dark red or maroon boxes with a Certificate of Authenticity. Those coins still accompanied by their certificate are worth considerably more to collectors. Like many other engravers, Bernard Sindall was first and foremost a sculptor, known particularly for his slightly abstract yet notably characterful figures. Sindall studied at the Brighton College of Art, and later as a recipient of the Prix de Rome, enjoyed two years in Italy absorbing the work of the great masters. Whilst in Rome, he exhibited at the Palazzo Venezia – one of his many exhibitions around the world and at the Royal Academy. Sindall was keen to share the knowledge and influences he’d acquired in Italy, and went on to teach at the City & Guilds of London Institute, inspiring contemporary sculptors such as the late Roy Noakes. His skill with depicting figures and animals was reflected in his designs for other coins, created for several countries around the world. Issued back in 1955, the elephants and giraffes he portrayed on the penny and halfpenny coins minted for Rhodesia and Nyasaland were well loved. He also designed a set of collector coins for the World Wildlife Fund. In a departure from birds and animals, Sindall produced designs featuring local views of Jersey, for the Channel Island’s post-decimalisation and Silver Jubilee coins. Bernard Sindall died in 1998. 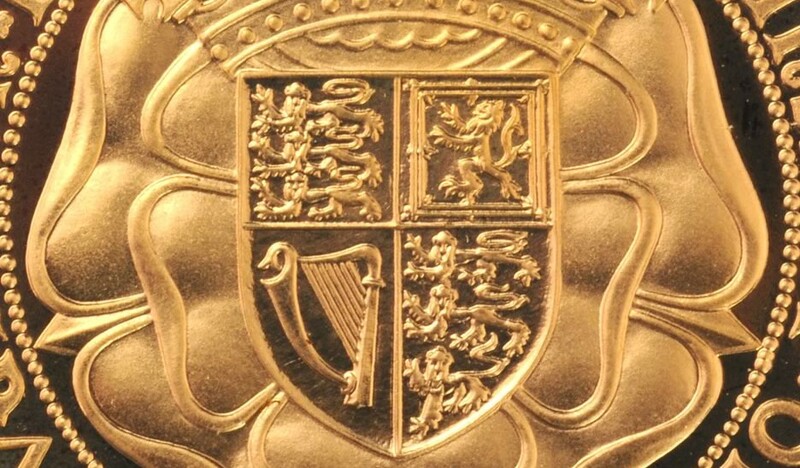 He may not have been the most prolific designer for the Royal Mint, but his 1989 Gold Sovereign remains possibly the most important of all recently minted Sovereigns. It’s probably true to say that Jean Baptiste Merlen was one of the supporting actors in the cast of the Royal Mint’s designers and engravers. But to be fair to Jean, he did work there during the period when two of the Mint’s greatest talents, William Wyon and Bernadetto Pistrucci, were at their most dominant. Jean Merlen’s origins are somewhat hazy. Some accounts suggest he was born in Belgium, but the majority say he was born in France in 1769, of Flemish parents. He worked as a medallist in the Paris Mint, where his output including the 1804 medal celebrating the coronation of Napoleon as Emperor. Following Napoleon’s defeat in 1815 at the Battle of Waterloo, Merlen’s job (and in fact the future of the Paris Mint itself) looked uncertain, so he emigrated to Britain and looked for work in London. Once again exact details of his employment at the time are sketchy, but it’s thought he started at the Royal Mint in 1820, on the recommendation of Pistrucci, whom he may well have met in France. Jean Merlen became Assistant Engraver under the Chief Engraver, William Wyon; Pistrucci was Chief Medallist. As an alien, technically Merlen wasn’t eligible for a full-time post at the Royal Mint, but this problem was bypassed by hiring him on a temporary basis, at four guineas a week. The majority of Merlen’s designs for the Royal Mint were reverses. His sole obverse (or head) was that of King George IV, used on the Crown coin from 1821 to 1822, and the rare 1823 Two Pound coin. Pistrucci’s famous George and the Dragon was on the other side. 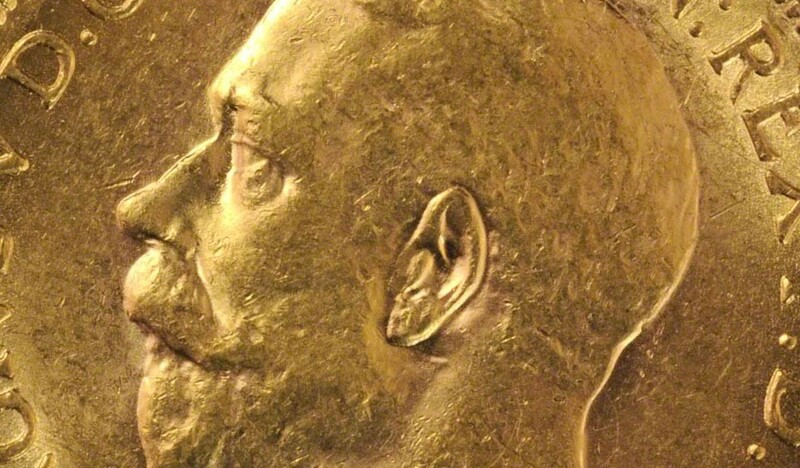 The reason for Merlen providing the obverse design illustrates Pistrucci’s confrontational character. Pistrucci’s own design was disliked by the King, who preferred the portrait by Sir Francis Chantrey. Pistrucci however declared that he would not create a design based on the work of another artist, so it Merlen who provided the interpretation instead. It has to be said, the result is rather elegant. 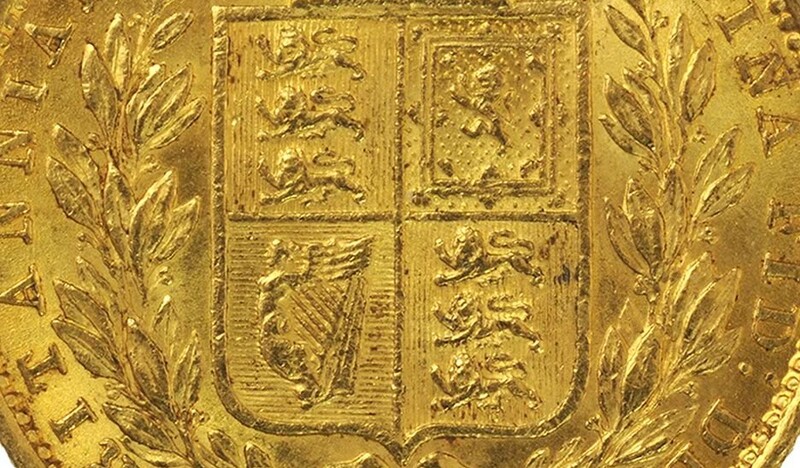 Among Jean Merlen’s many designs for reverses are the crowned shield surrounded by a wreath, used for the King William IV half-sovereign produced from 1834 till the King’s death in 1837. This was subsequently used for the second Gold Sovereign of Queen Victoria’s reign, and for other coins including the Silver Crown and Half Crown. He also produced designs for lower value coins, including the shilling, sixpence and silver threepence, and the design used on the Maundy coins (handed out by the reigning monarch on the Thursday before Good Friday) from 1822 to 1887. Although Merlen’s designs continued to be used during the Victorian period, his employment effectively ended with the Queen’s accession to the throne. Perhaps the prospect of a large workload of designing and engraving the new Queen’s coins was too much – after all, by then Jean Merlen was 75. Details of his demise are as vague as those of his birth, but it’s generally believed he returned to either Paris or Brussels, where he died in 1850.